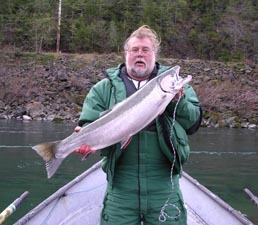 Conventional tackle (spinning or level wind) or Fly gear, I like to catch fish. My preference is big fish and places that I have a connection to. A guide can not be an expert on every river, but can find waters suited to his style. 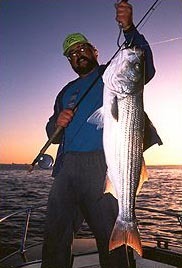 The photo on the left is a striper caught with the help of writer Dan Blanton. It was early on a September morning with the sun just coming up. Striper weight was 22.5 lbs. and we caught several more that morning on flies. 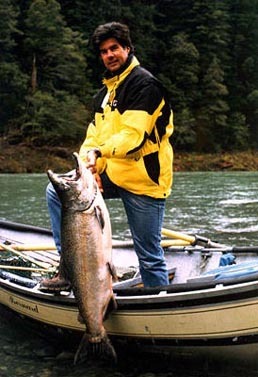 Photo above is on the Smith River, 40lb King Salmon caught on a plug November 28, 1998. This was Cliff's first king and his arms still ache from the 20-min. fight. Fly or a bobber, all my tackle is top of the line. So is my guide service.